"One day the absurdity of the almost universal human belief in the slavery of other animals will be palpable. We shall then have discovered our souls and become worthier of sharing this planet with them." - Martin Luther King Jr. Imagine a place where children discover the magic of reading and learn to live with compassion for all. Give to Bert's Book Barn to help both children and animals today! We rescued Bert after he was abandoned in a field for 18 months lonely and scared. He was dirty, matted, and had a full coat in summer weather that was over a hundred degrees. Bert needed hoof trimming, medical attention, proper food, and a lot of love. We brought him to the sanctuary, and he learned to trust us, an amazing feat considering his previous experience with people giving up on him. He was a gentle sweetheart who loves company, carrots, and broccoli! Bert was older and as a senior citizen, he suffers from chronic arthritis and degenerative disc disease. Our excellent veterinary team provided him with medication and careful care to make sure he was as comfortable as possible in his later years. We said goodbye to Bert at the UC Davis large animal hospital after his degenerative disc disease led to chronic health problems. We miss him terribly, but the love and joy he brought to Blackberry Creek will live on through his Book Barn. The idea for the Book Barn was born years ago when our co-founder noticed the excitement with which even the most reluctant readers in her class would read about animals and the issues which affected them. It gained steam after several research studies confirmed that children who read to animals increase their fluency by 12-20% due to increased confidence and lowered anxiety. 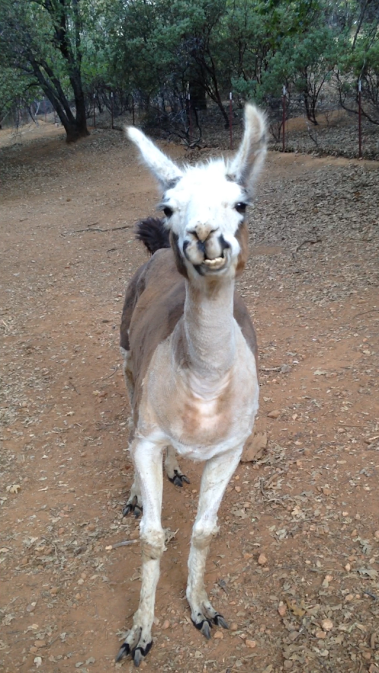 ​The Book Barn will be named in honor of our lovable llama, Bert, whose charming personality engaged both children and adults alike and added love and laughter to our sanctuary grounds. When a reality, Bert's Book Barn will host emerging readers for family story times, struggling readers who want to boost confidence by reading aloud to an animal friend by the banks of Blackberry Creek, and student leaders who will educate the public on animal issues through materials offered on its shelves.